I had a dream the other night, that I was one of three siblings. One sibling had stripped our father of his skin to see how we are made. He was laid out on a gurney, and we looked at the red layers of muscle, studying how they fold and overlap. Our father was invincible and extremely angry. Maybe it was the process we had put him through, or maybe he was that way before, but he was insane and out to get us. Wherever we went, he followed – all over the world. We were on the run, and the situation was dire. We couldn’t kill the father, because the father was within all of us. But he was out to destroy what he had made. You could make some religious allusions to all of this symbolism, or you could say that this is nature. I did not play myself in the dream, and the father and siblings were not my own. 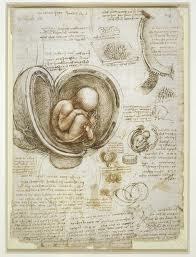 The imagery stems from a slide show that Camille Paglia displayed in her talk last week at the library, of Leonardo Da Vinci’s private notebooks. 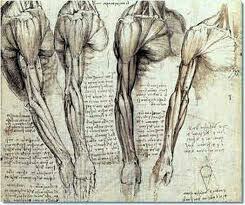 In it, he studied the structure of muscles, and a fetus inside a dissected womb. If anyone had found out, at the time, that he was dissecting cadavers, the church would have severely punished him for it, maybe even put him to death. The drawings give us a sense that he is looking at things he should not be seeing. This week, I read Frankenstein, by Mary Shelley. I love her for being such an emancipated woman, born to radical parents in 1797. Frankenstein is not my kind of book. I only read it because it was on a list of the greatest books ever written, and it’s so obviously influenced our culture, where science (or philosophy as it was called in Shelley’s day) can go too far, producing something gruesome and disastrous. But once Frankenstein achieves his obsession, he is horrified as the creature takes its first breath. He realizes his mistake and deserts the monster. But after a series of murders of all those closest to Frankenstein, the creature gets a chance to tell his story. He began his life with love, but everyone he met hated and reviled him, turning his pain into a need for revenge. Around the time that the novel was written, Mary had lost her first baby and had just given birth to a second, named William. Her half-sister committed suicide, and her partner, Percy Shelley, still had a wife who drowned herself in the Serpentine. Mary then lost a third child. After the novel was finished, she lost her son William, gave birth to Percy Florence who survived, and had a dangerous miscarriage after that. In the summer of 1822, Percy, her partner, drowned with two friends in a storm off the coast of Pisa. The badly decomposed bodies were burned, but Percy’s heart was removed and eventually buried in Rome. Mary was only twenty-five. Reading her story in the introduction was much more horrific than the ghost story she wrote while summering with Percy and Lord Byron. The natural reaction, especially with losing a child, is to think at first that they will come back to life. I edited a novel once, where a mother lost her baby and couldn’t let go of the little corpse. It had to be pried away from her. The writer was Australian, and was certain that American audiences wouldn’t be able to handle it, since in our culture we choose to be so far removed from death and dying. Becoming a mother is to also face the possibility of ultimate loss – the chance of miscarriage, the chance of failing to protect your child from a world that is full of struggle, disease, and danger. For Shelley, bringing a corpse-like creature to life is the ultimate revenge against nature that takes away. My strange dream of the father stripped of his skin reminds me of seeing the Bodies Exhibit. All those parts that make a whole, the muscles and organs frozen in time, not quite life-like in their preserved state, but disturbing because they were alive once, now frozen in space, dead, and there for our voyeuristic fascination. In an art class, the students were told to spend twenty minutes drawing my head, and twenty minutes drawing a skull placed directly behind me. They moved in a circle alternating between death and life. For some reason, that day, all the students drew me to look much older than I am. I looked decrepit, as they over-emphasized the sagging lines of my face. I wished I had never looked. I have reached that age, my thirties, where you begin to realize that you’re never going backwards. The physical body has changed its chemistry completely. I’ll never be tiny and thin again, my metabolism has slowed down, my liver throws back all the toxins I send its way, my immune system is sensitive to any disturbance. But beyond my body, I’ve grown much stronger. My spirit feels invincible, unbreakable, my sense of discipline is becoming as solid as a rock, and nothing but my body slowly breaking down, could ever stop me at this point. It’s not quite as much fun as being young, dumb, and out of control, but this is the season for building my life. Knowing how quickly it all passes, I push harder each day to express in words and art the things that make us feel alive and well. You are currently reading The Birth Of Frankenstein at Lauren J. Barnhart.